The new two person Aqua Star 2 scooter is now a reality. PLANTATION, Florida -- Building upon the success of the single seat AS1 model, Aqua Star envisioned a two person scooter, the AS2. After intense design and engineering, it is now a reality. Now couples can share the underwater experience together. The second person at the controls eliminates any fear for the timid. The AS2 is perfectly suited for couples to explore underwater wonders in a very safe environment. Both riders are free to dismount, swim around and climb back aboard. The diving helmet is nicely integrated into the scooters body; the rider's head goes inside an air chamber within the helmet which is constantly supplied with air from scuba tanks lasting seventy minutes attached to the front body of the scooter. The helmet features a flat fog resistant glass, 99% distortion free giving a clear underwater experience, thus reducing the noxious feeling commonly associated with the bubble top models of the past. The new Aqua Star scooters are sleeker, faster, and are much lighter (AS1 80 lbs and AS2 160 lbs.) than older models currently in operation. Aqua Star incorporated the latest in technology, design and quality using only the best very substrates available today. Each scooter is powered by two electric motors one for forward movement and another for vertical movement, providing precise control, maneuverability and safety. Both the controls operate like your typical motorbike, just turn the handlebars for direction and push the batons for speed and depth. Pressure and depth gauges are provided on the control bar. 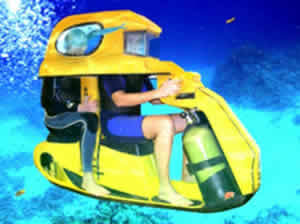 With speed up to 3.1 mph and operating depth of up to 12 meters, riders have access to shallow reefs and caves. The motors run by a rechargeable battery lasting up to 2.5 hours, which means it is very environment friendly and in no way damages the fabulous underwater ecosystem. Novices can master the controls in the training course which can be completed in just a few minutes Those who are not strong swimmers or who have minor disabilities can still ride the bike and you can wear your glasses or contact lenses without difficulty. No diving certification is needed, no experience is required. Safety divers control ascent and descent into the water, then you have control of direction. A line attached to a buoy keeps the scooter safely tethered to the world above. "This unique underwater experience is very safe and definitely something you should do at least once in your lifetime", said Gary Gordon, president of Aqua Star USA. "It's an incredible experience that will open your eyes to an amazing new world. The scenery is unbelievable with countless species of fish and an array of bright and varied colors in an underwater tropical paradise. And if you bring along your waterproof camera your experience will surely last a life time". This is terrible news for reefs... already poorly trained divers are touching and bumping into reefs, unintentionally destroying them. I fear that with the poor downward visibility and restricted mobility of this device, that people will will bump into things even more. What if the scooter is used in current? How will one deal with swells? "Stay far from stuff" most will reply. Yeah, right, people won't. They will want to get close to see better. If properly supervised by divers I could see how this could work. My hope is that the companies that operate tours are going to sensitize users to the dangers and harm they could do to the reefs if the bump into things. Don't get me wrong though, I am a firm believer that everyone should get to experience the wonders of the underwater world. I just don't want good ideas like this one mis-used. I think people should learn how to dive. Get certified. You'll love the freedom of a well planned and executed dive. Cheers!